If you’re part of my SnapChat family (follow along @merrittbeck), you saw this look when I was trying on some new pieces I got in the mail a couple weeks back! 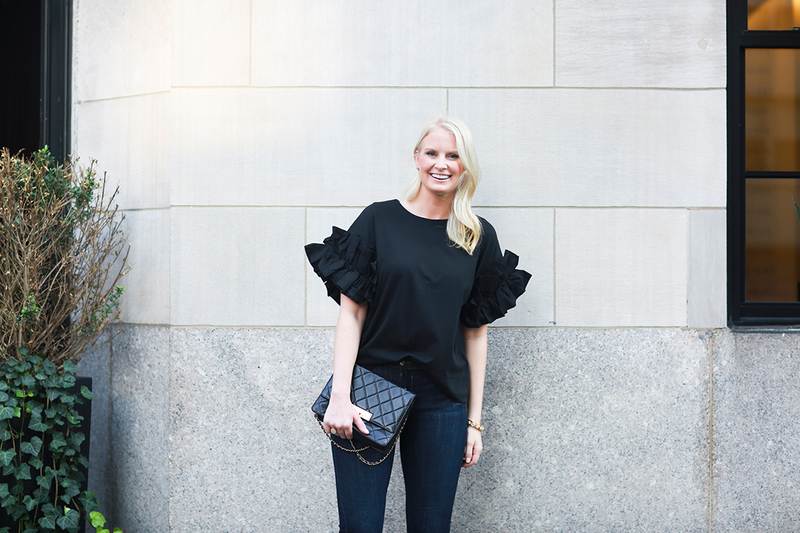 I’d been eyeing this ruffle sleeve top for a few weeks prior to purchasing it, and my blogger friend Emily Lunstroth even sent me a pic of it saying it looked like me before I’d even bought it! Accurate. I am OBSESSED with this top! As I mentioned in last week’s post, I like to find items in neutral colors that have special details – it keeps my fall/winter wardrobe from becoming boring or repetitive. This top is certainly one of those pieces – it’s just FUN. 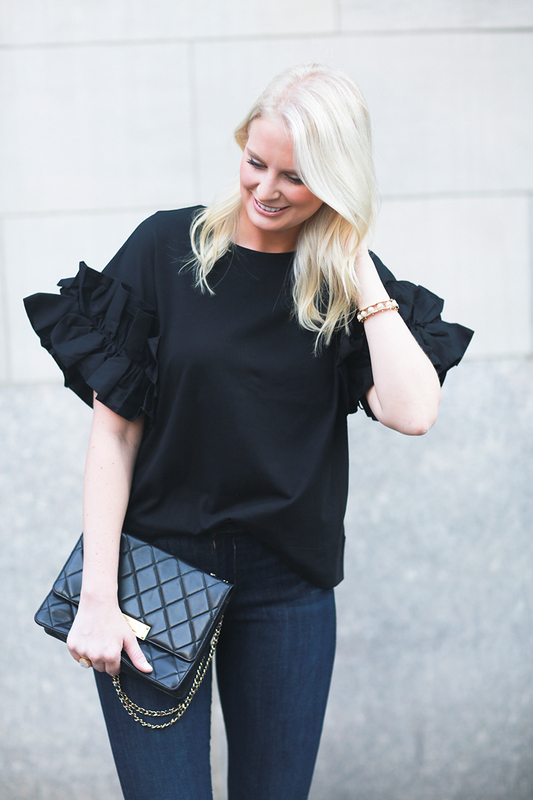 The ruffled sleeves make such a statement, but because of the easy t-shirt style and solid black color, it’s a staple too. Does that even make sense? Can there be such a thing as a statement staple? I’m running with it. A few other statement staples you may want to take a peek at include a trendy pair of jeans in a classic shade, an everyday sweater with a cut-out detail, a striped blouse with elegant sleeves, and a solid blazer with exaggerated epaulets. 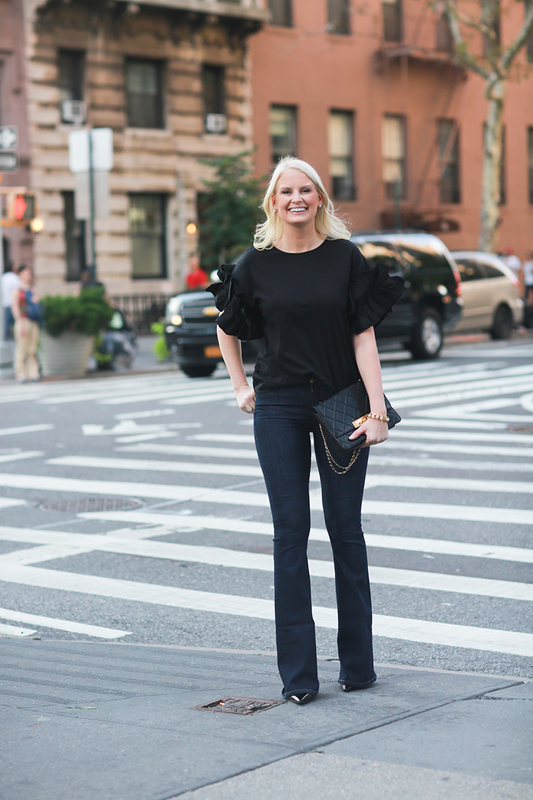 Another item that came in the same package from Nordstrom is this pair of dark wash flared FRAME jeans. I love the flattering high waist and how long these are! They look amazing with my favorite black pumps for dinner, don’t you think? I think they’ll be a go-to pair I reach for with all my favorite sweaters once the weather cools down too. The dark wash seems to elevate the look of denim that you just can’t achieve with lighter washes, so these are perfect for dressing up. I just love how perfectly balances this look is! The ruffles and the flare are so good together! Have a great day ahead, lady! 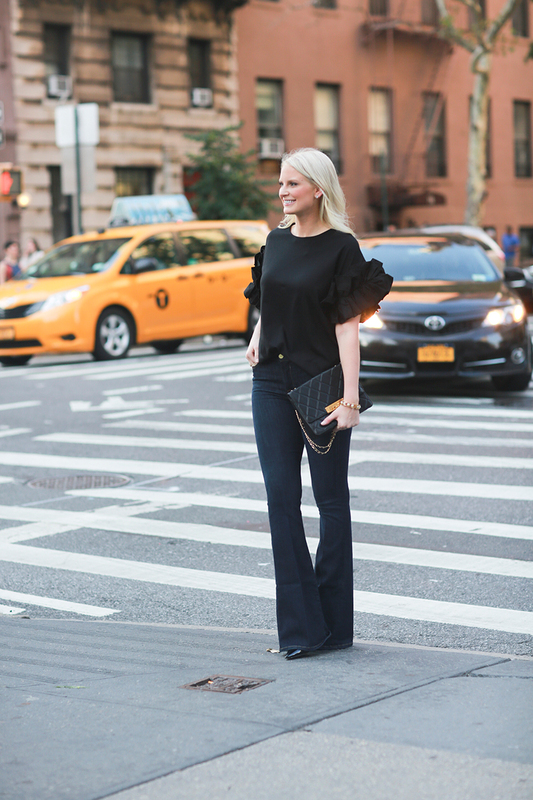 Love this outfit Merritt – that top…LOVE! Hope you are having a great time in New York – I love following along on your snaps. Your outfit for Tibi was beautiful! OMG that blouse is EVERYTHING, and most of all, I love how you don’t actually have that much going on but everything is so polished and fits you perfectly. Important! Loved this top on snap and love it on you in these snapshots!! You look gorgeous! This outfit is the perfect combination of chic and casual. Love it! This is such a fab look for FW, love this top. I absolutely LOVE this top. 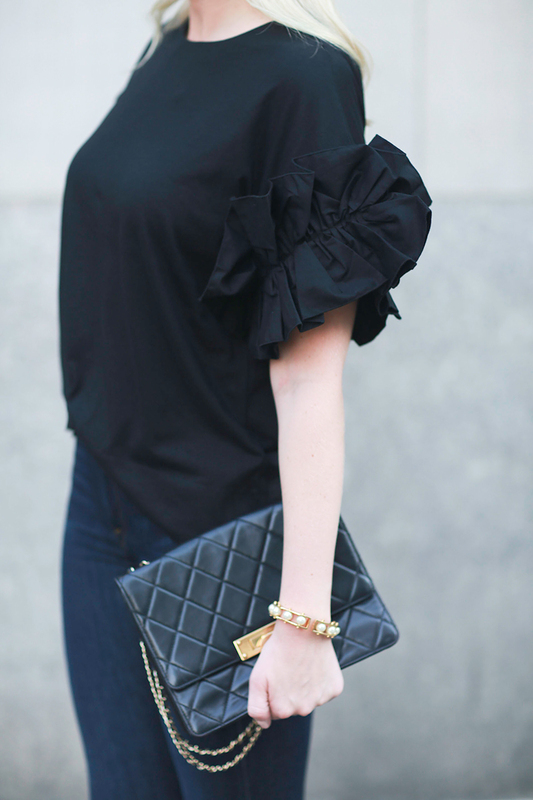 Those ruffle sleeves are so chic! Really love that top, Merritt!